The leaders of the world's biggest military alliance are meeting in Warsaw this weekend. Key item on their itinerary: Money. 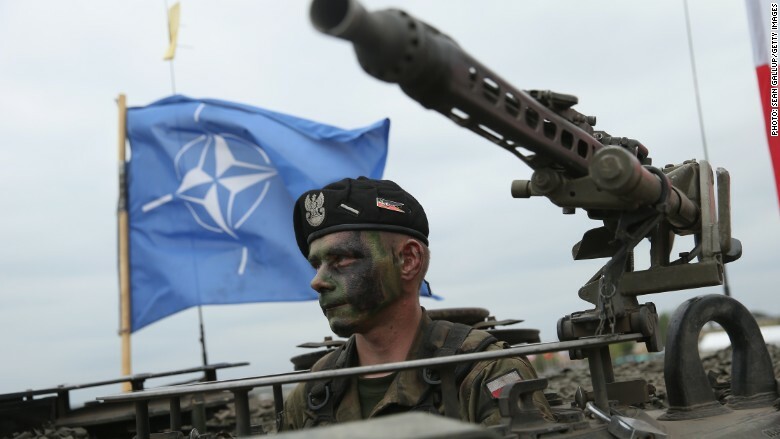 NATO has for years been pushing for more spending by its member states. The alliance increased overall defense spending for the first time in two decades in 2015, but most NATO countries still don't pay their recommended share. At the start of the summit, NATO Secretary General Jens Stoltenberg said, "The world is a more dangerous place than just a few years ago." 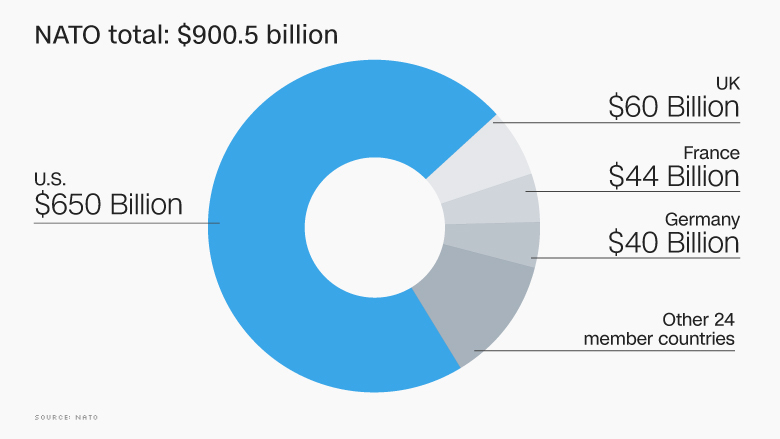 New spending data released on Monday show the U.S. shells out far more money on defense than any other nation on the planet. NATO admits it has an "over-reliance" on the U.S. for the provision of essential capabilities, including intelligence, surveillance and reconnaissance, air-to-air refueling, ballistic missile defense and airborne electronic warfare. 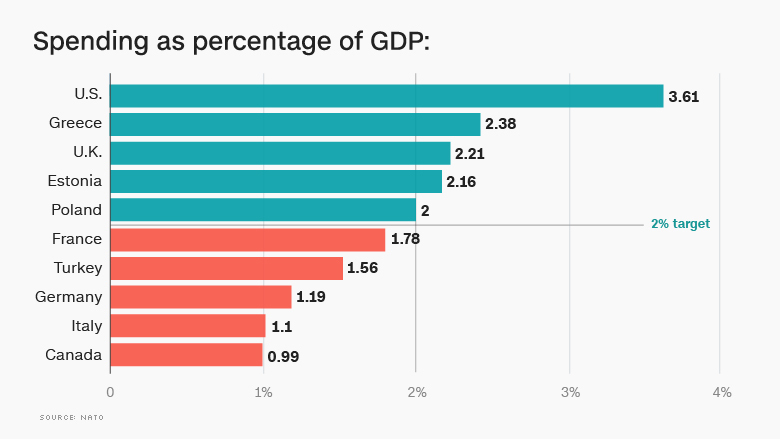 The U.S. also spends the highest proportion of its GDP on defense: 3.61%. The second biggest NATO spender in proportional terms is Greece, at 2.38%, according to NATO. U.S. presidential candidate Hillary Clinton called on other NATO members to spend more on defense. Donald Trump has gone even further, saying the U.S. should rethink its involvement in the military alliance because it is "obsolete" and other states don't pay a fair share. The rest lag behind. Germany spent 1.19% of its GDP on defense last year, France forked out 1.78%. 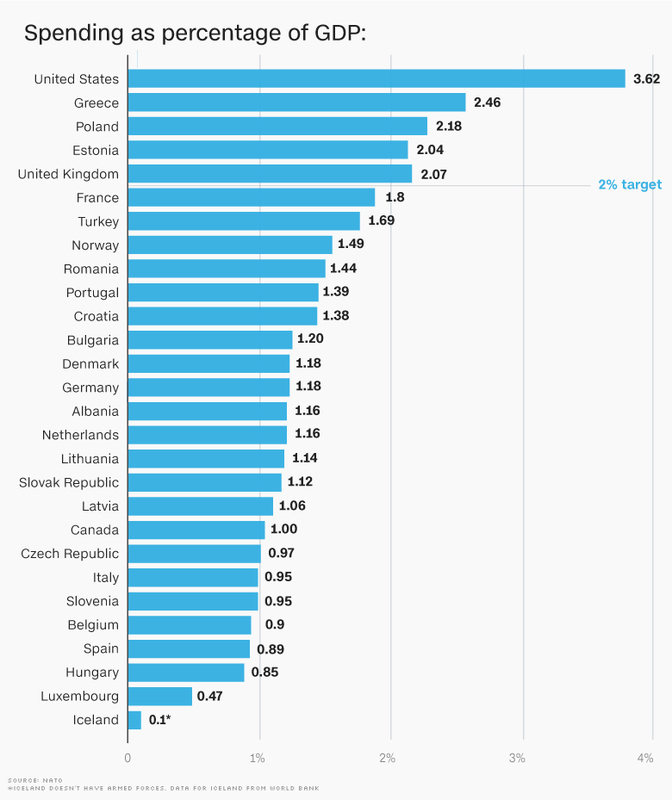 Five other countries spend less than 1%, according to NATO's estimates for this year: Canada, Slovenia, Belgium, Spain and Luxembourg. All member countries that fall below the threshold committed in 2014 to gradually ramp up military spending to reach the target within the next decade. NATO is pushing hard for the 2% guideline to be taken more seriously. "We are spending more and we are spending better, but we have a very long way to go," Stoltenberg said ahead of the summit.